Now that the last minute panic of getting A Succubus for Remembrance is nearly out of the way (there will be a print version - details here as soon as that's out) it's time to catch up on some of the other posts, such as the increasingly erroneously named #52Books. I'm a little further along than books 21-24, but I'm still going to fall short by some way. I'll try again next year with the additional resolution of not imploding like the England cricket team in Australia the moment a submission deadline looms. Hodgson’s The House on the Borderland is a fairly important weird text as he was one of the first to plough down that particular furrow, and The House on the Borderland is a very weird book indeed. The majority of the book is the account of the un-named protagonist of the various weird things that happen to him within the eponymous house, which seems to be some kind of dimensional nexus. 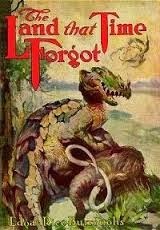 Hodgson doesn’t waste any time as within the first few chapters his protagonist is under siege from hideous pig men. He fights them off and then the book swings off into an audacious flight of cosmic weirdness where the man sees time accelerate all around him, eventually seeing the end of the solar system and travelling through some kind of rebirth that places him right back where he started. The final segment switches back to more conventional horror as a more hideous entity than the pig men creeps up on both the house and the hapless narrator. It’s an old book, so it’s not an easy read, especially as Hodgson seems to regard commas as caltrops to be sprinkled liberally through the text. Despite that I never found it dull and the crazy inventiveness makes it easier to forgive the barely coherent plot. It reads more like Hodgson is letting his imagination tumble out onto the page rather than cynically exploiting the “Insert Own Plot” con-trick much over-used by modern writers. It can be picked up for free from the Gutenberg project and is worth a look for fans of old weird fiction. Yay, for nostalgia. 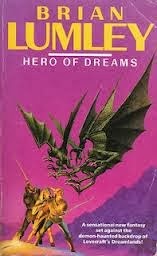 Lumley is probably better known for his Cthulhu Mythos fiction and Necroscope series, but he also found time to pen this fantasy series set in Lovecraft's dreamlands during the eighties. It's an unashamed fantasy romp and the main characters, David Hero and Eldin the Wanderer, are loveable dolts that would last about two seconds in modern GRRM-influenced fantasy, but who cares, it's fun. I really like Shane McKenzie’s novellas. They move fast, have interesting ideas and don't faff about. No insert-own-plot or look-at-how-clever-my-writing-is wankery here, just a simple idea executed very well. 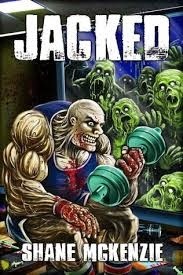 Jacked features two employees trapped in a gym after weird green slime starts pouring out of the ground in a river. Anyone caught in the slime is turned into a squishy, slime-spewing zombie and soon Sid and Gabe are besieged. Unfortunately for them, also trapped in the gym with them is Crow—a monstrous, crazed steroid junkie—and it’s only a matter of time before being outside starts to look safer than being inside. Time to take another dip into the copyright-expired Gutenberg barrel to dig out another pulp classic. I’ve always had a soft spot for monster movies and the 1975 Amicus adaptation was a favourite of mine while growing up. The dinosaurs might look rubbery and immobile by today’s fx standards, but it’s always been a fun adventure romp. The first half of the book is a masterclass in pulp adventure writing. There’s the dastardly shelling of an ocean liner, the heroic capture of a German U-boat, betrayals and reversals, until both crews end up having to co-operate after fetching up on the mysterious and dinosaur-infested land of Caprona. The film version wisely decided to give Von Schoenvorts’ character a little more depth. In the book the dirty Boche are a fairly one-dimensional bunch of backstabbing assholes (understandable given the book was written in 1918). Sadly, the protagonist, Bowen Tyler, ends up getting lost and isolated for the second half of the book and the book ends up getting lost with him. After a wham-bam start the book peters out.